DES MOINES – The Iowa Barnstormers have signed offensive lineman Kyle Avaloy to the 2019 roster, Head Coach Dixie Wooten announced today. 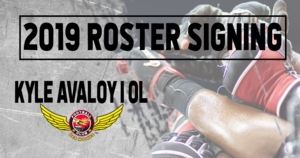 Avaloy (6-5, 310, Illinois State) joins the Iowa Barnstormers for his first season in the Indoor Football League (IFL). Collegiately, Avaloy played for Illinois State for five years where he appeared at left guard and center. While playing for the Redbirds, Avaloy was a three year starter and earned Pre-Season FCS All-American and 2nd Team All-MVFC honors. Following his collegiate career, Avaloy earned invitations to the Tampa Bay Buccaneers and Chicago Bears rookie mini-camps. Avaloy gained indoor experience last season when he appeared in four games with the Maine Mammoth of the National Arena League (NAL).